This is the second year in a row that we have been to Moody Gardens in Galveston, Texas over Thanksgiving break and we love it there! This time around we got to take the kids with us and they enjoyed every second of it. My favorite thing about Moody Gardens is the Ice Land that they do every year. 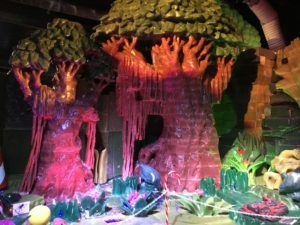 This year it was all about the rainforest and in 2016 it was under the sea. You can check out my review of last year on According 2 Mandy. The entire Ice Land is done up in ice and they even have an ice slide! We loved seeing the butterflies, birds and more made of ice. The kids went down the ice slide so many times that we had to drag them away from it. There is also a bar inside and a place to buy hot chocolate at the end. I love that they give you a parka to wear as you freeze your way through the Ice Land. 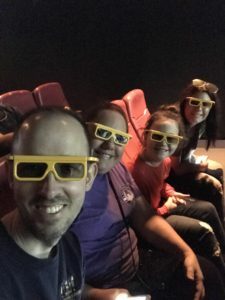 While at Moody Gardens, we also checked out a 4D movie. This was so much fun as we sat in chairs where snow fell on ice, things blew at our feet and you felt just like you were in the movie. 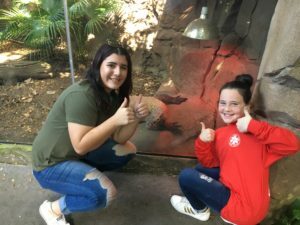 Our daughters had a blast going through the aquarium and also the rainforest. We got the chance to see penguins swimming, bats hanging out and more. They also enjoyed the ropes course. The zip line has been shut down since the hurricane, but hopefully, they can get it fixed soon. One other thing we did was go ice skating, which was new this year. This was a lot of fun, but this was not near as easy as I thought it would be. If you are ever going to Galveston, Texas, make sure you check out Moody Gardens! You will not want to miss out on this amazing experience and Ice Land is a must see! I can't wait to go back next year. We are Headed to the Spongebob SubPants Adventure at Moody Gardens! Plus get a Coupon Code from ME!